During World War I and World War II, the mothers, sisters, wives, and girlfriends of Allied servicemen wore pendants and pins proclaiming their support for their loved ones fighting overseas. But as Netherlands-based Georgian– and Victorian-era jewelry collector Agram.m reminds us (that’s her username on Show & Tell), these pieces of sweetheart jewelry, as they are called, were not the first examples of baubles used to proclaim one’s support for a war effort. 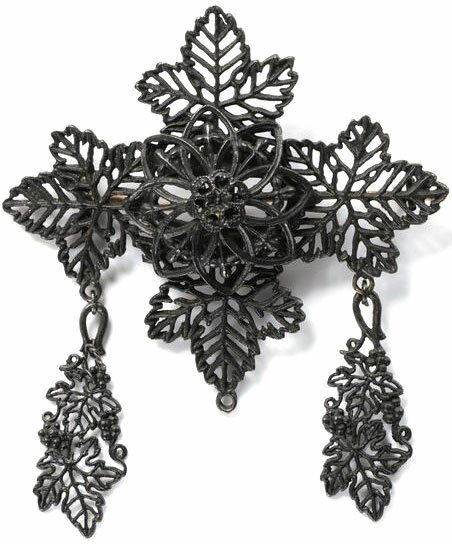 “In the early years of the 19th century, citizens of what is now Germany, then called Prussia, were called upon by members of the royal family to exchange their gold and silver jewelry for Gothic-looking pieces of ornamental iron jewelry,” Agram says. The precious metals were sold to finance Prussia’s part in the Napoleonic Wars, which raged across Europe and beyond from 1803 to 1815. 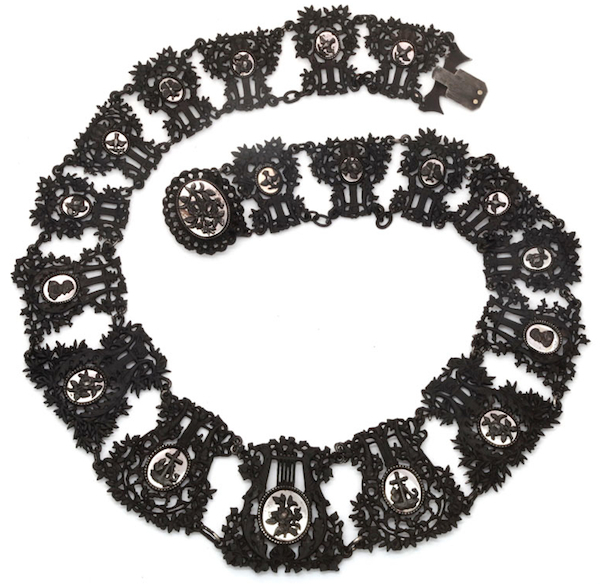 Top: This Berlin iron necklace from the early 1800s features iron cameos backed by mirrored steel. The anchors are thought to symbolize loyalty. Photo via 1stDibs. 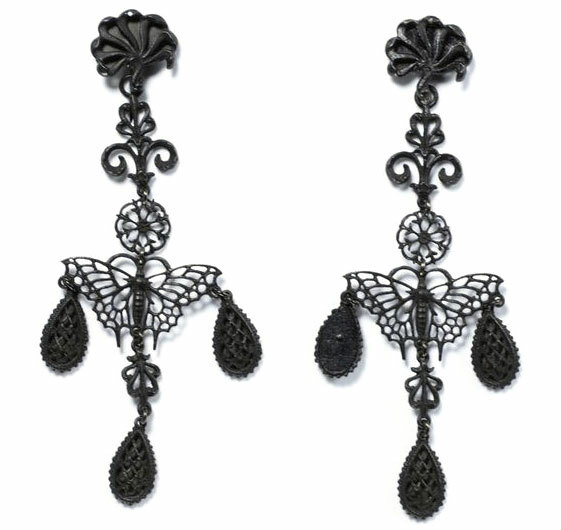 Above: These butterfly earrings were designed by Siméon Pierre Devaranne. Photo via the Victoria and Albert Museum. The roots of this “Berlin iron” go back to 1804 and the establishment of the Königliche Eisengießerei (the royal foundry). “When the foundry opened, its portfolio included cast-iron utensils, vases, candlesticks, bowls, plaques, and medallions, as well as larger objects such as garden furniture, fencing, and even bridges,” she says. But the ongoing war with France spurred a trade in iron jewelry, which artists produced in 1806 using the same lost-wax casting process as many types of fine jewelry. This leafy brooch is thought to have been designed by Johann Conrad Geiss. Photo via the Victoria and Albert Museum. Berlin iron, says Agram, has a number of distinguishing characteristics. Because they are made of iron, the pieces are magnetic. Iron, of course, rusts, so the pieces were blackened to seal them from rust-producing moisture in the air, usually with a lacquer made from flaxseed. 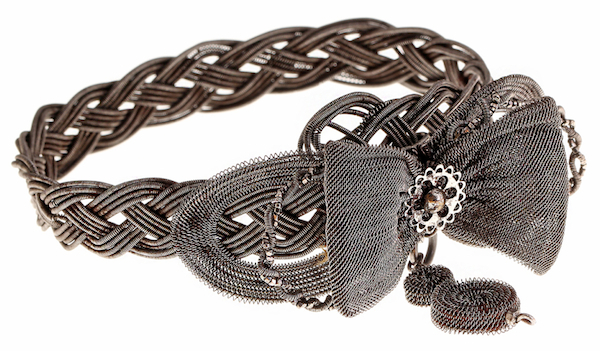 Finally, small rings were used to connect the individual sections of a Berlin iron necklace or bracelet to each other, giving some pieces an armor-like appearance. This example of Silesian wirework bears the mark of Johann Conrad Geiss. Photo via Bell and Bird. Great Article!! The only correction I would make is to point out that what is now Germany is much more than what was then “Prussia”. Head casted in BERLIN IRON FOUNDRY SET silver very large. Like to know it’s history. “ ” The ’52 Bowmans are like little masterpieces.